In Halloweenish honour of the week’s creepiest story, how about a call for catchy songs considered perfectly acceptable in the 1960s and ’70s that would now be considered ghoulmeshically chauvinistic or blatantly misogynistic? And as an example, Earl send the video that’s atop this post, explaining: This is by THE GREATEST BAND EVER, but the only place you could get away with similar hateful lyrics today would be in the antediluvian antics of adolescent hip hop. I have just one word: Yikes! So yeah, since tonight’s the night for scary things, let’s see if we can drum up a few more wildly inappropriate (by today’s standards, which I like to think are generally pretty enlightened) songs from the Manse era, i.e. my childhood in this old house. Those years would be 1964 to 1975, and your challenge is to come up with some more nominees for the list. Oh, and let’s expand the criteria a little bit to include songs that – again, by today’s standards – would be considered wildly offensive to any group of people, not just women. Now isn’t that a doozy? Now, folks: can you come up with some nominees for frightfully inappropriate songs that once upon a time we all just happily sang along with? And as you’re doing so, why don’t we all be grateful that, while there’s an awful lot of things to be said for the good old days – like, for instance, that we were all a lot younger – there are some ways in which the world is better in 2014. Happy Halloween, happy fall – and oh yes, happy time change! 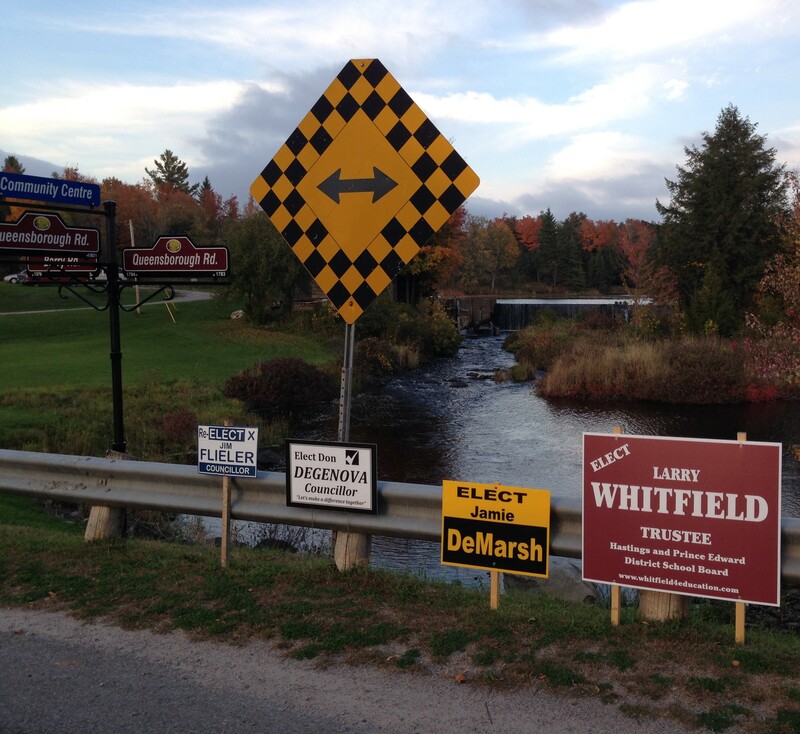 This simple but beautiful fall display brightens my day every time I drive through the minuscule hamlet of Hazzard’s Corners. How nice it is that people take the time to make displays like this that make life more pleasant for us all! Happy Evening Before Halloween from the Manse! I hope that you have got all your bags of goodies done up for the costumed youngsters who’ll be showing up at your door tomorrow night. I’ve just finished that task myself, and have to confess that preparing Halloween bags at the end of a very busy day at work, and in between those two things doing still more of the leaf-raking that the Manse yard demands at this time of year, has left me so tired that I can hardly keep my eyes open to write this. But what the heck: here are some random – though bound by a seasonal theme – thoughts before we all retire this evening. First, since the weather reports threaten snow this weekend – which makes one realize that it won’t be long before fall slips into winter – I wanted to make note of a nice autumn thing before it’s too late. It’s the display that’s been on view for the past few weeks at a home in “downtown” Hazzard’s Corners, a hamlet even smaller than Queensborough that is just six kilometres west of us. You can see the display in my photo atop this post, though my photo doesn’t do justice to it. I just think that the combination of pumpkins and other gourds at the front door, and the still-bright marigolds in the flowerbeds, are simply perfect, and very pretty. And I’ve heard other people say the same thing. I don’t know the family that lives there, but every morning when I drive by this house on my way to work I silently thank them for a display that brings a bit of beauty to the start of my day. 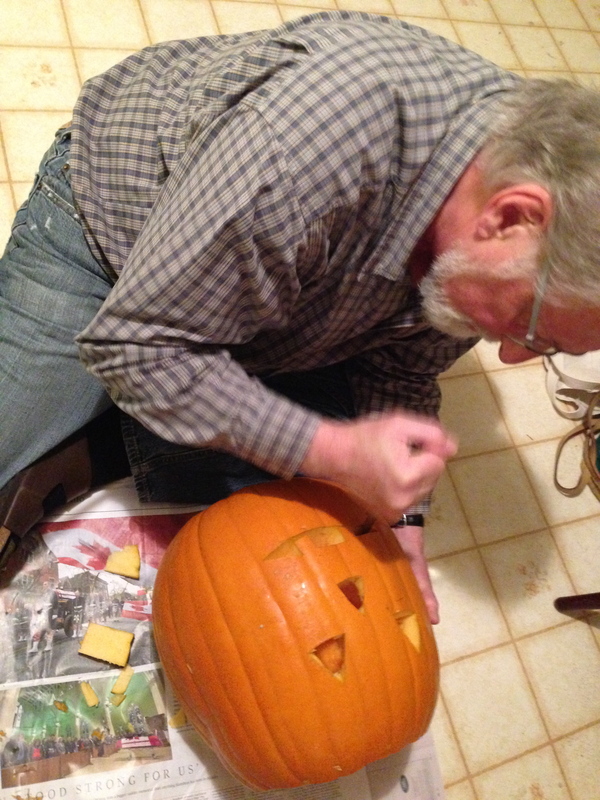 Raymond is an excellent jack-o-lantern carver – as you can see! Second: I am very excited about Halloween! Last year was my first Halloween in the Manse since I was 14 years old – not, as I like to stress, exactly yesterday – and I had a ball handing out bags of treats to the cute-as-a-button pandas and Spidermen and princesses who came around. (Details here.) We are all set for a repeat performance this year; Raymond has (as you can see in the accompanying photo) carved the jack-o-lanterns quite brilliantly yet again here in the Manse kitchen, so we’re all set. And finally: isn’t it just splendid that this is the weekend when that hour of sleep that was stolen from us last spring in the switch to Daylight Saving Time (you don’t ever want to get me started on the foolishness of Daylight Saving Time) is finally given back? Why, it makes the threat of snow seem like a mere piffle. Anyway, happy Halloween and happy middle-of-autumn-heading-for-winter, folks! This post is about a very simple thing – just an empty bird’s nest that appeared in the front yard of the Manse one recent morning in the wake of a windy autumn night. Presumably it had tumbled out of one of the huge evergreen trees that stand just to the north of our old house, since it was close to them that I spotted it lying on the ground. There were no signs of any birds, adults or babies, distressed or otherwise, in the general vicinity, so one has to hope that the family for whom it was lovingly and carefully constructed had moved on to other climes or quarters. But the nest’s construction was indeed careful and solid, because it was thoroughly intact upon arrival on the ground. A parent bird – or, I hope, two, since these duties should be shared – had done a fine job of bringing in and weaving together twigs and grasses so that the nestlings might hatch and live safely and comfortably. 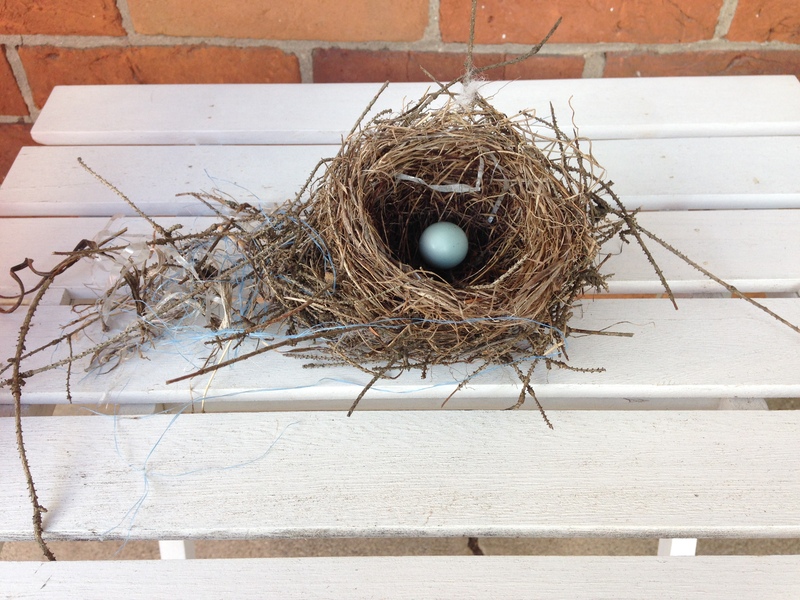 I picked up the nest and put it on a small white wooden table that sits on the Manse’s front porch. And then I remembered that many months ago I’d found a robin’s egg on the ground, showing no sign of a live baby robin being inside it; it was nowhere near a tree or a nest that I could see, so I guessed that a predator had picked it up, stolen it and inadvertently dropped it. The robin’s egg was inside the house, so I fetched it and put it in the nest. And the little display looked quite pretty, don’t you think? Pretty enough that, when Raymond posted his photo of it on Facebook with a message to an artist friend of ours, Nikol Haskova, who’s been playing around with the theme of bird’s nests in her work recently, she responded very enthusiastically. She thought it was downright lovely, and particularly liked the blue thread (a stray piece of plastic twine the builder bird had found), I suspect because it went nicely with the blue of the egg. At any rate, it made me feel rather proud of my little natural-art installation. If you drive by the Manse these days you can still see the product of the bird’s housebuilding efforts. Alas, though, the robin’s egg is gone; I imagine some hungry varmint stole it in the night. (You never know what creatures might be roaming around the Manse grounds under cover of darkness, though if you guessed “raccoons” I think you’d be right 9.9 times out of 10.) Given that the egg was extremely old, I don’t think the varmint got much good eating out of it. Which serves him right. It’s not every day I get to think, if only fleetingly, that I’ve done something artistic! 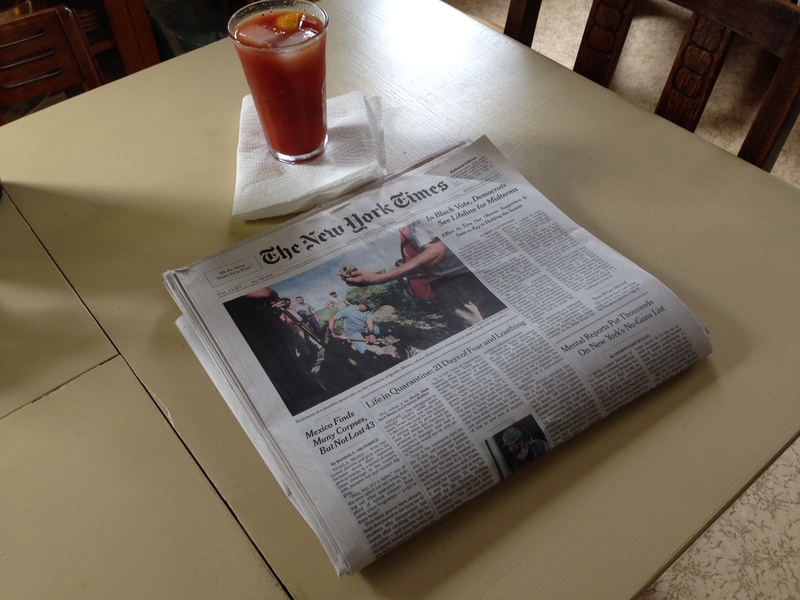 People, these are the making of a perfect Sunday: that day’s Sunday New York Times, and a Katherine’s Famous Bloody Mary. How I wish it were possible to have those every Sunday! Sadly, at least in the case of the Sunday Times, it may not be – at least until I accomplish my mission of getting the Sunday Times sold locally. Which probably won’t be easy. Several months ago I did a post (it’s here, in case you’re just dying to read it) bemoaning the unavailability of the Sunday New York Times here in our neck of the woods. Not, you understand, that I expected to find copies of the Sunday New York Times piled up at the convenience stores in Madoc and Tweed so that I could pick one up of a Sunday morning once Raymond and I moved here; I was fully prepared for the unavailability situation. But that doesn’t mean I have to like it. The Times is still, in my opinion, the best newspaper in the world. (Though of course the Guardian is excellent too.) And while I spend a lot of of the news-consumption time of my waking life “consuming” (okay, reading) news on my mobile phone, there are circumstances in which I still love an old-fashioned ink-on-paper newspaper. I love, for instance, the local weekly papers that I read cover to cover because they tell me all kinds of interesting things that are happening right around me here in Queensborough. And I love the ink-on-paper Sunday New York Times. Which I have not as yet been successful at bringing into the Manse on Sundays, as I vowed in that earlier post I would try to do; I’ve been a little too busy to spend much time on that mission. 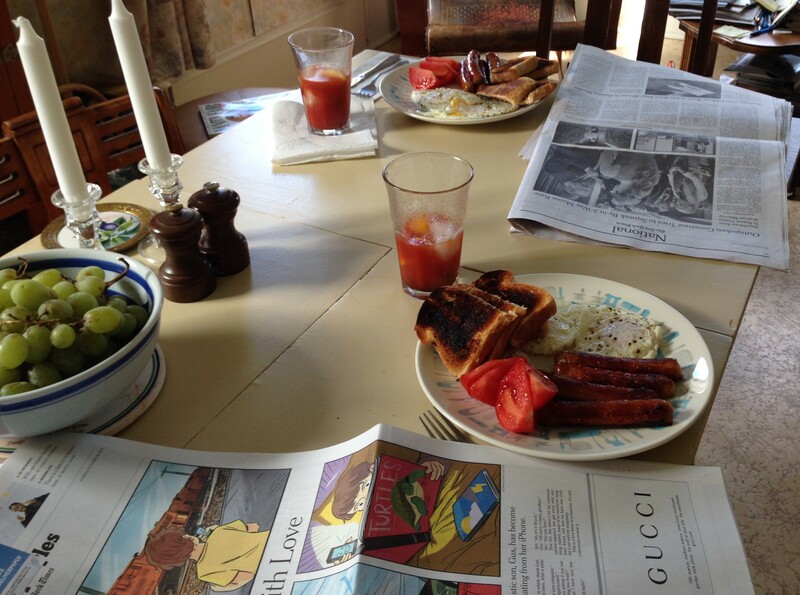 An ideal Sunday breakfast at the Manse: bacon and eggs (and yes, I like my toast well-done), and the Sunday New York Times spread out all over the table. What bliss! For two journalists, that really is the way Sundays should be. Which means it’s time for me to get serious about getting the Sunday New York Times within buying range of us here in the Madoc-Tweed-Queensborough area. Because I think that everybody deserves such Sundays! Your turn, people: name the cheesiest Manse-era pop song! As regular readers probably know, I sometimes like to mark Fridays – best day of the week! – with a musically themed post. Hey, it’s been a long, hard work week for all of us (save those who are retired), and I figure that on Friday night all we really want to do is kick back and relax. In other words: less of Katherine’s prose, and more musical memories and vintage videos. On this particular Friday I have been inspired once again to adopt a musical theme by an email I received today from my good friend and former colleague Earl, one of the cleverest and funniest people I have ever had the privilege to know. Earl is brilliant at digging up goofy, hilarious things on the internet, and apparently today he came across just such a thing – and fortunately for us all, he decided to share it through me. And into the bargain, he gave me a great idea for a post. Oh, people. If you’ve already clicked on this video, you know how awful it is. If you haven’t, you must. It may in fact be the cheesiest video – and song – of all time. But here’s the problem: ubiquitously ghastly as the Starland Vocal Band‘s one and only hit, Afternoon Delight, was, it is ineligible for competition in our newly created (thanks to Earl’s inspiration) contest called Name the Cheesiest Pop Song of the Manse Era. Why? Because it was released in 1976! Too late for the Manse Era – that is, Manse Era 1.0, as Earl cleverly puts it. (Manse Era 2.0 having started in 2012, when Raymond and I reclaimed this old house that I grew up in.) The years of my childhood here – Manse Era 1.0 – were 1964 to 1975, and so Afternoon Delight falls just a bit outside of the eligibility criteria. I think we can all agree that the years 1964 to 1975 were when some of the greatest pop songs of all time were released. Without even stopping to think about it, I’ll list California Dreamin’, Son of a Preacher Man, Norwegian Wood, Both Sides Now, Like a Rolling Stone, Love Child, Honky Tonk Women, Ode to Billie Joe, Sloop John B, Angel of the Morning, Take it Easy, I Feel the Earth Move, Down on the Corner, Walk on By and I’m a Believer. And that doesn’t come close to even scratching the surface. Wow. And then there was the cheesy crap! And lord knows there was lots and lots and lots of it. So I think it’s time to name the greatest hits, so to speak, of the bad music of the era. No, we can’t include Afternoon Delight. (Sadly.) But we can include my nomination, Kung Fu Fighting – a ridiculous and terrible song from the era when Joey Edwards was the star DJ here on our local AM radio station, CJBQ. That’s the one that you will have seen at the top of this post. But people, really what I (and your fellow Meanwhile, at the Manse readers) want to know about are your nominations. Comb through those musical memories, rack your brains, and share: what were the worst popular songs, the real stinkers, of that otherwise golden era for music? Send ’em in – and we can collectively wallow in the fun of really bad music that we all know by heart. And wish we didn’t. “Return to sender”? What ever happened to the good old days? “What’s your 911 number?” Raymond and I were asked that more than once after we’d bought the Manse. The first time we were completely puzzled. What on earth was meant by a “911 number”? I mean, 911 is a number – and it’s a general number, for everyone. Why would we have our own? But yes, some urbanization of the Ontario countryside took place during the decades I was away from it, and roads that never had any name before – save perhaps for “Concession 5” or “Seventh Line” – suddenly do. Here at the Manse, for instance, we are at 847 Bosley Rd. But Bosley Road is a new moniker since the days of my childhood at this address. I assume the name comes from the Bosley family that used to live just down the way from the Manse, and that’s absolutely fine with me; but it still feels a little artificial – put-on, you might say – to my ears. As for street numbers – well, I do find them useful when I’m driving to a certain home or business for the first time, but they still seem rather odd. However, I suppose in the overall cause of emergency workers being able to locate you when your house is on fire, street names and numbers are a good idea. And I think I’m safe in assuming that efficiency in emergencies was a primary reason behind coming up with these names and numbers in the first place. The other day I wrote a thank-you note to an old friend who had done something special for Raymond and me. I had her telephone number and email address, but I wanted to send her my thanks the traditional way, in my own handwriting. What I didn’t have was her street number, and her listing in the telephone book failed to cough it up; all it said was “RR2 Madoc.” Well, since that is the way all rural mail was addressed through all the years I was growing up in Queensborough, and since that mail always reached its destination, I assumed I was safe in going with that. After all, don’t the rural mail carriers know everyone on their routes? They always used to, that’s for sure. Well I never! What is the world coming to? 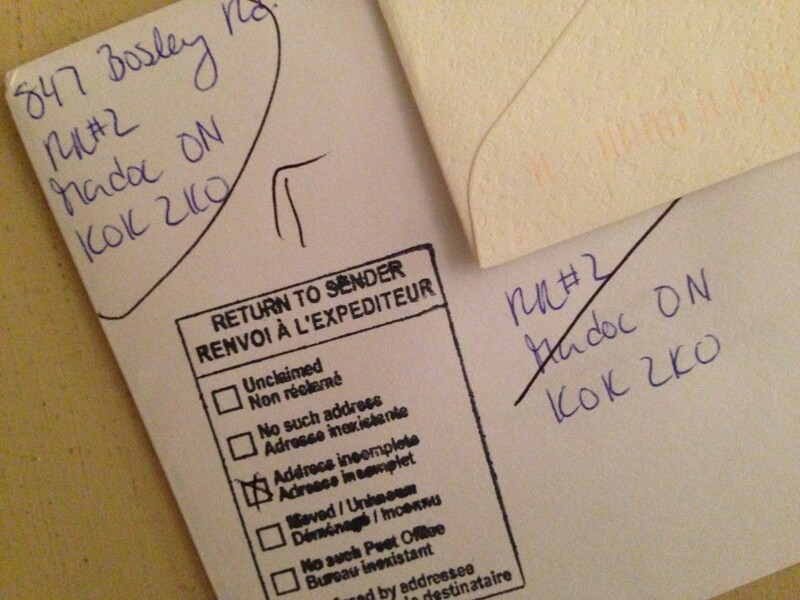 Longtime readers might recall a post I did quite a while ago (it’s here if you’d like to refresh your memory) reminiscing about the introduction of those new-fangled things called postal codes back in the early 1970s, and how infuriated many people were about them. 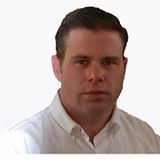 Back then I heard more than one person of a certain ago – like, say, probably around the age I am now – vow never ever to use postal codes, since the mail had always been delivered perfectly well without them. As a young teenager I found their old-fashioned anti-progress attitude (which is how I saw it) quit hilarious. Now, however, with my annoyance at my thank-you note having been peremptorily returned to me, I see that things have changed. I have officially become a postal fuddy-duddy. And you know what? I am proud of it.